Cisco is about to help China network up to half a million cameras in the city of Chongqing. Ostensibly it’s a crime-prevention maneuver, but given China’s record, this, and plenty of other tech, could help spy on the populace. The same surveillance grid that monitors for, say, traffic buildups or a break-in to a store at night could easily be adapted to actively surveil the public. All it would take is hooking up a face recognition system to the network, hooked to a public ID database (which China most certainly has). Add in algorithmic alarms to identify if two politically “questionable” people were meeting, or even if they were seen in what may be deemed as the wrong location, and it’s very powerful. This kind of technology is rapidly becoming feasible: Witness the fuss kicked up when Facebook instigated it for photos in its social network, and the fact that Google has had the capability to automatically identify faces in the billions of pages it crawls for its search indexing–but has refused to implement because of fears of abuses. 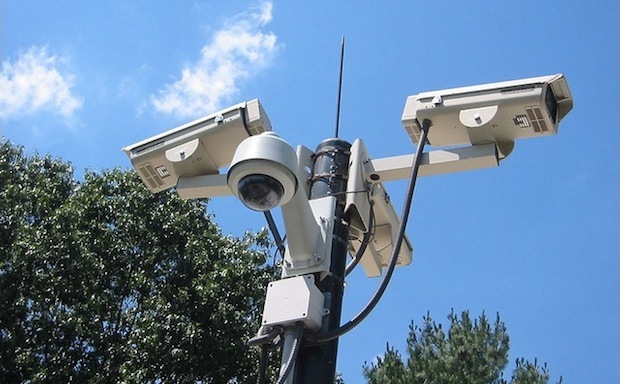 With enough computing power at its disposal, there’s no reason the government of Chongqing couldn’t try and recognize every single face the camera network sees. It could even get assistance with recognizing its targets by co-opting in tracking data from cell phone networks: The U.S. already mandates tracking cell phone locations at an operator level for later criminal investigation (and it’s amazingly detailed) and it would be easy to adapt a public surveillance face recognizer to get a “first fix” for who may be in the scene from which cell phones are present in a given area. In a nation with a censorship and surveillance ethos running through its political structure, it’s also highly plausible that the surveillance camera network could be hooked up to a cell phone call monitoring system that does voice recognition. That would require enormous computing power, to sample and check for the characteristic qualities of millions of user’s voices, but it’s not computationally impossible–particularly if you have enough supercomputers handy. Simpler would be a system that monitors for keywords or phrases–something China has been rumored to already have in place (and it marries with fantastical rumors about similar U.S. tech). Crowd-sourced voice patterns are now a well known trick, and are key to systems like Nuance’s newest voice-recognizing iPhone apps. Tied to the camera system it could easily be used to build a case against a citizen for breaking laws about political dissent, since pictures tell a thousand words. Failing all of these high-tech and fairly subtle systems, it wouldn’t be too far a step for Chongqing phase II to incorporate city-wide iris scanners for an even more personal and overt form of person recognition. After all, if a city in Mexico can try it, why not China? The city of Leon, one of the largest in Mexico, is working with biometrics firm Global Rainmakers to install iris scanning tech throughout the city’s infrastructure. The goal is to make it the “most secure city in the world,” and the system will connect to train, bus, and ATM networks to make travel and cash access more secure. Criminals are automatically scanned, and the population has an opt-in incentive because it’ll make many things easier and possibly safer–the ultimate goal is to stamp on fraud. There’s a sop to the principles of an open society, with GR highlighting the benefits of adaptive digital advertising (Minority Report…honestly!) but when you have single unit scanner machines that can capture up to 50 irises per minute, what you’re talking about here is a large integrated person positioning system. There’s is a passive surveillance trick you may never have heard of, and it could easily work on powerful computers monitoring Chongqing’s camera feeds: IDing folks from their gait. It turns out that they particular way we all walk–the cadence of our footsteps, the way we swing our arms and legs and so on–is about as individual as a fingerprint, and basically needs just enough seconds of video feed of someone walking to compare to a database. The benefits of gait spotting include working from more angles, as people can’t be relied upon to stare at cameras for face recognition, and that it can work in the rain–when coats and umbrellas also obscure people’s faces. All you need is a positive ID (which could come, at first, from a face recognition algorithm connected to a clean video feed of an individual–say, as they walked through a turnstile) and a powerful computer. China’s not short of those. Meanwhile, consider the rumors that China wants to buy a “big piece” Facebook and that Facebook is exploring a launch in the nation. We already know that social networking is a fast-growing phenomenon in China, and that to some extent the absence of Facebook has pushed a raft of competing systems into existence–making it harder for the government to intervene. If Facebook were to officially launch in China, it’s impossible to believe it would be given free reign–it would certainly have to comply with the same legal censorship rules that forced Google to pull out of the nation. And whether it was legally complicit, or the authorities created their own entry point to the data, Facebook would be delivering a wealth of socio-political data to the government on its people, including tagged photos from every conceivable angle that would quite definitely aid a face recognition system hooked up to a public surveillance grid. The Peaceful Chongqing project is but a single city, with a simple camera system that’s being efficiently networked. But considering how swiftly China’s blending its political needs with high tech, most of this kind of public monitoring is plausible, if not easy … and one city could easily be a test-bed for a broader plan. Furthermore, even without any of the super-high tech recognition tech–it’s completely possible that a low-tech approach could use the cameras to detect groups of people forming. If a group became too large, was in the wrong place or seemed to be blocking traffic, there’s no reason China’s security forces wouldn’t hold back wading in.